Auchencorth Moss, part of a sensitive peatland ecosystem in central southern Scotland, is one of our most important monitoring sites. It is a valuable location for long-term monitoring of surface / atmosphere exchange fluctuations and measurements indicating environmental change. As a result of the large number of parameters measured at the site it is part of a wide range of monitoring networks and is also used in collaborative work with the wider scientific community. Peatland sites are globally important carbon stores as well as sensitive habitats often vulnerable to long-term environmental change. The Auchencorth Moss site is part of an extensive transitional lowland raised bog in Scotland. 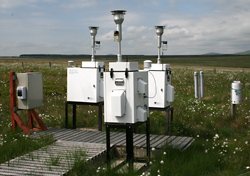 It has been used as a monitoring site since the 1980s and now offers the capability to measure a wide range of environmental variables including carbon catchment studies, surface / atmosphere exchange fluxes, real-time measurements of aerosol composition and reactive gases and meteorological variables. Measurements taken at the site contribute to national and international records. The Auchencorth Moss catchment (3.35 km2) forms part of a low-lying, ombrotrophic peatland of about 10 km2. It is located approximately 18km south of Edinburgh in Scotland. The vegetation consists of a patchy mix of grasses and sedges covering a mainly Sphagnum base layer on a typical peatland hummock/hollow microtopography. Common species include Deschampsia flexuosa, Eriophorum vaginatum and Juncus effusus, with a greater occurrence of shrubs such as Calluna vulgaris, Erica tetralix and Vaccinium myrtillus in the ungrazed SSSI. The site drains via the Black Burn, north-east into the North Esk, aided by several overgrown drainage ditches which form a herring-bone pattern across the catchment. 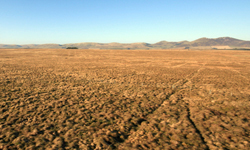 The site receives annual precipitation of ~1200mm. Water table depth ranges from below -55cm to 4.5cm above the peat surface, with a mean of approximately -12.5cm. Annual nitrogen deposition is approximately 8kg N ha-1 yr-1. Auchencorth Moss is one of the UK’s measurement supersites for concentrations and surface/atmosphere exchange fluxes of trace gases and aerosols, including physical and chemical properties. Of particular significance is the continuous operation of a MARGA wet-chemistry analyser for hourly measurement of gas-phase NH3, HNO3, HCl, SO2 and aerosol inorganic chemical composition of PM2.5 and PM10 (SO42-, NO3-, Cl-, NH4+, Na+, Mg2+, Ca2+ and K+). The instrument is based on denuder/steam jet aerosol collector technology, coupled with online ion-chromatography, which provides an attractive reference for a range of gas/aerosol measurements. It is a Regional Station within the World Meteorological Organisation’s Global Atmosphere Watch programme. Site data are submitted to global databases, as well as UK-Air and European databases, enhancing the use of the measurement data. Take a virtual 360degree tour of the site. As well as state-of-the-art equipment onsite or available from CEH (including TOF-AMS, CIMS, PTRMS, QCL and CRDS), the site has a cabin equipped with bench space, inlets and air conditioning. It is designed for housing short-term experiments and visiting scientists. As a result new collaborative opportunities are available to use the station as an atmospheric observatory facility. For further details on all parameters measured at Auchencorth Moss, please refer to the website at www.auchencorth.ceh.ac.uk.